We recently published details of the first financial well-being study conducted in Ireland. 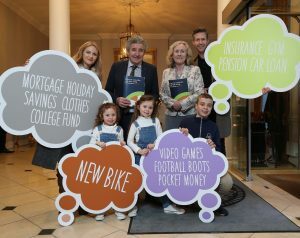 The research looks at the behaviours and circumstances that influence financial well-being, whether people in Ireland can meet all of their current financial needs comfortably and how they are able to deal with future financial shocks. 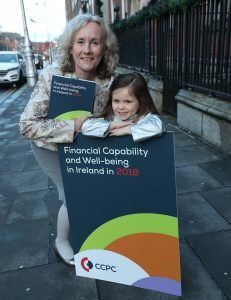 Overall, the CCPC’s report finds that people in Ireland are doing well in terms of general financial well-being, with an average score of 64 out of 100. Internationally, the overall score for Ireland is lower than Norway (77) but higher than Australia and New Zealand (both 59) and nearly the same as Canada, where the overall score was 65. The report finds that 52% of people can meet current commitments, but have little put aside for financial shocks. 25% of people are financially ‘secure’ with both their current financial situation and set up for the future being strong, with some improvement to be made in planning for retirement. 52% of people are ‘doing fine now, but with little put by’ and do well in meeting their current commitments and have fairly good financial comfort, but they have less resilience for the immediate future and for retirement. 16% of people are ‘just about coping’ and appear to be at risk of falling into financial difficulties with little put aside for the future. 7% of people are ‘struggling’ and are in financial difficulty now with no reserves to protect themselves now or into the future. For the majority of those surveyed, these two behaviours were the most important for overall financial well-being. Financial confidence is also important and financial education can help to improve financial well-being. The CCPC is committed to playing its part in developing financial capability and well-being through our financial education programmes and information and by strongly advocating for the provision of financial education in schools. For more information, check out the full summary report.